Your special day came and went as quickly as everyone warned you it would. They said, “you better soak in every moment of it because it really flies by!” and “oh how my wedding day feels like ages ago!” Now your wedding day is passed and you’re feeling nostalgic with a bit of relief! That beautiful wedding dress you daydreamed about all your life and then waited months to be able to wear on your wedding day is now sitting on “that chair” in your bedroom waiting for its next move. Have you considered what you’ll do with your wedding dress after your big day? If y0u’re thinking of saving it for your daughter one day, there’s a high chance they’ll decline the offer just as you politely declined your mom’s puffy sleeve pastry-looking wedding dress. Getting your wedding dress professionally cleaned is the first step in wedding dress preservation. The sooner you can get your dress cleaned, the better. Some brides take months to finally take care of the cleaning, but that can be damaging for the dress as stains begin to set in. So get that dress cleaned promptly! If you’re on your honeymoon, maybe it’s a good time to call in one last maid-of-honour duty! Beware of the invisible stains. The worst stains are the ones you cannot see. Like your aunt’s foundation that’s perfectly blended into the shoulder part of your dress. Don’t forget about those inconspicuous drinks like vodka sodas or white wine. Some of these drinks are just full of sugar ready to eat away at the delicate fibres of your dress. Well getting your dress cleaned right away can prevent these stains from turning brown in the future! If you’d rather use a box because it looks prettier than a garment bag, gently lay the freshly cleaned wedding dress folded flat in the box. Wrap the gown in tissue paper, placing the paper in the sleeves and in any crevices to prevent fabric-on-fabric friction. Store your garment in a cool, dry space. Keep your garment in a dimly lit or dark space; light can cause yellowing in natural fibres. Some brides would also love to preserve their fresh flower bouquet. It’s a great idea because bouquets are absolutely beautiful and could look just as beautiful if dried correctly. So here’s how you could preserve your wedding bouquet, Typically, there are three ways that it can be done. First, hang the bouquet to dry using a rope tied around the handle and then tying it onto a clothing rack or from the ceiling. Hang your bouquet in a safe area, upside down for several weeks or months and they will dry nicely. You can then store them in a bouquet preservation box and put it into storage. 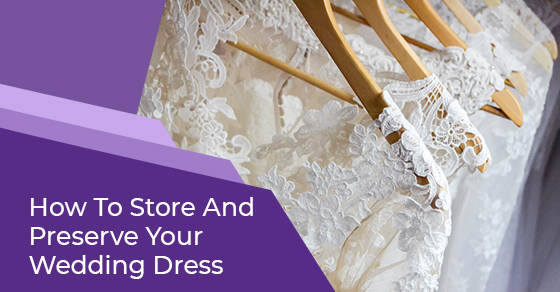 If you are running low on storage space at home and prefer not to stuff your wedding dress in with all your other things in your storage closet, perhaps a self-storage unit might be a solution for you. In fact, while you’re storing away you’re wedding momentos, why not free up a whole lot more space and move a lot of your seasonal belongings in storage as well. Having the extra space at home leaves more room for the things you love to do every day. Maybe you’ll have more room to finally create that little craft nook you’ve always wanted. Regardless, maybe this new chapter in your life also means it’s a good time to declutter and make room for new home projects and renovations. A self-storage unit can really help you get organized and make some much-needed space. If you are worried about your wedding gown or your other most loved items being affected by climate conditions like humidity, moisture, or dryness due to extreme cold conditions, there are rental storage units available that are climate controlled. climate controlled storage is heated during the winter months and kept cool in the summer so as to maintain a constant, moderate temperature level throughout the year. Climate controlled self-storage units provide a dry, comfortable, dust-controlled environment. Jiffy Storage is one of the most reliable and trusted self-storage facilities in the GTA with some of the best-maintained climate controlled units around. Some clients have even been choosing to store their trusted belongings with Jiffy for over 20 years. The main reason people prefer Jiffy Storage is because they are so flexible in the way they accommodate everyone’s storage needs, particularly with how long they will need it. If you only need storage for 24 hours, Jiffy can help. If you need long-term climate controlled storage, it is available at Jiffy at competitive prices. It is usually recommended to secure a self-storage space for one month regardless if you need it for a shorter period of time. There are times where space is limited due to high-demand and since life can be unexpected, having your storage space reserved for at least a month will ensure you have a backup plan if needed and it is the most cost-efficient way to go. For more information, call Jiffy Storage at 416 74-JIFFY (54339) or contact us here.